9' x 6' x 3"
A commissioned work for the Bernie Miller Lightbox at the Blackwood Gallery, University of Toronto, Mississauga. This photograph is a panorama; a composite image made up of 9 photographs, taken every half hour starting at 5pm and ending at 9pm. 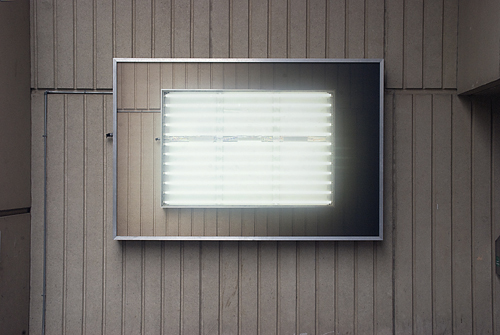 The camera was swiveled slightly between each shot, so that at 5pm it was pointing at the left side of the billboard and by 9pm it was pointing at the right side.